Indianapolis— It's that time of year again. 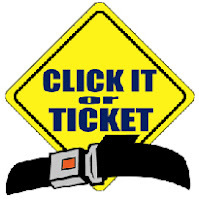 You better buckle up behind the wheel because police officers will be watching. The annual "Click It Or Ticket" campaign kicked off Thursday. More than 260 state and local law enforcement agencies are taking part in the program. As a result, drivers can expect to see many more police officers patrolling Indiana's roadways, looking for people breaking the state's seatbelt enforcement law. Really? So in the aftermath of Barnes v. State, this is a good time to set up checkpoints so police can stop cars to see if people are wearing their seat belts? It is time that people stand up and say "enough is enough." I believe the seat belt law was amended after it was initially passed so LEOs can pull over cars for just a seatbelt citation. Initially when it was passed, they could only write a ticket if it was pulled over for some other reason such as speeding. Not that I agree with the reasoning. It's one of several nanny state laws we have on the books, such as the so-called guns-at-work law that was passed in the 2010 legislative session. IS, you're exactly right. It used to be a secondary law. They amended the law to make it primary, possibly due to a threat from the federal government. I know law enforcement officials will dispute this, but I do not think you can tell whether someone is wearing their seat belt if they're driving any signficant speed. What's wrong wit the guns at work law? I agree with that. Simple. The guns-at-work law forces business owners to allow guns on their property (specifically, locked away in an employee's car out of sight) regardless of the business owner or property owner's desire. Of course, several well connected businesses were exempted from the law, such as Lilly, as were hospitals and some others. Ironically, the guns-at-work law allows residential property owners to declare their property a gun free zone, but doesn't give the same ability to business owners. I know it's an area of conflicting rights, the right of the employee to protect themselves versus the right of the business owner to run his business as he pleases. Personally, I think if a potential employee values his right to carry a gun so highly, he should exercise his ability to only work for employers who think similarly. I don't think there's anything wrong with government giving people MORE rights. The fact is employer policies were stripping people of their gun rights. People drive to and from work, often through bad areas of town. People should have the right to have a gun with them. I think what the legislature passed made perfect sense, a balance of employer and employee rights. While we differ on a few issues, I will agree that the seat belt law is ridiculous. Just FYI, the reason IMPD is doing the seat belt check points is because they are given federal grants to do so; otherwise, they don't have a dime to spend on seat belt enforcement. Exactly Jedna...they do them because it's federal money. Of coure, it's still taxpayer money either way and it's still an intrustion on people's privacy rights to pull over driver's who have done ntohign wrong. A friend of the family was ticketed years ago because when she was pulled-over, her seatbelt was under her arm. She's a shorter lady, and the seat belt wore dangerously high on her to properly work while she drove. Regardless, I was incensed she was ticketed because I do not believe there is anything in the law stating HOW one is to wear their seat belt. I'm no lawyer, obviously, but something seems off. I think everyone should wear a seat belt -- I just don't like there's a law forcing people to wear one. Bradley, I was ticketed for the exact same offense. I looked it up. There's some safe driving manual put out by the feds that the seat belt has to be done a certain way, and that's the standard the law cites. I looked it up after I got a ticket. And FWIW, I wasn't speeding or anything else at the time either. I explained to the officer I had a cardiac pacemaker in the left part of my chest, about where a normal use of a seatbelt would go over. I even presented my cardiac pacemaker's manufacturer's card with the pacemaker info to the officer, but it didn't help. The seat belt law says you need to have a letter from your doctor that needs to be on your person and, if I remember correctly, on file with the DMV. I think my family friend also was not speeding (I doubt she was) and was only pulled-over for the belt because the officer originally did not see the belt. Again, I just do not like the law. I guess I am libertarian when it comes to the seat belt law!